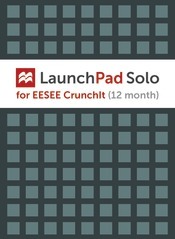 LaunchPad Solo for CrunchIt and EESEE is available in Six-month or Twelve-month subscriptions. Freeman/Macmillan’s CrunchIt! is accessible via LaunchPad for a single location for pre-loaded data sets across our Statistics textbooks. CrunchIt! is a web-based statistical program that allows users to perform all of the statistical operations and graphing needed for an introductory statistics course and more. It saves users time by automatically loading data from W. H. Freeman’s statistics textbooks, and provides the flexibility to edit and import additional data. With a familiar Excel®-like interface, users can easily navigate through the program to collect, analyze, and interpret data. Also available in LaunchPad Solo: 30+ EESEE case studies! The EESEE case studies, developed by The Ohio State University Department of Statistics, teach students to apply their statistical skills by exploring actual case studies using real data.